The Ethiopian government has dismissed threats by the Union of Islamic Courts (UIC) militia in Somalia that it might attack the capital Addis Ababa. An Ethiopian government spokesman said threats like this had been made before. The UIC's defence chief had earlier called for Muslims worldwide to help them combat Ethiopian troops, who he said were fighting in central Somalia. Ethiopia has acknowledged assistance to Somali government forces, but denies having any fighters inside the country. A spokesman for the Ethiopian ministry of information, Zemedkhun Tekle, said that if extremists within the Islamic Courts could attack Addis Ababa then they would have done so by now. Mr Zemedkhun said they had not attacked because Ethiopia could protect itself. There has been heavy fighting between the Islamists and troops loyal to the transitional government in recent days, around the town of Baidoa. Both sides claim to have killed hundreds, while aid agencies say there are dozens dead. Analysts fear the fighting could escalate into full-scale war. The UIC say Ethiopian troops are fighting alongside the transitional government. The Islamist militia control the Somali capital Mogadishu and large parts of the south. On Saturday, the Islamists' defence chief, Sheikh Yusuf Mohamed Siad, urged Muslims worldwide to join a "holy war" against Ethiopia. The Ethiopians have not formally acknowledged sending troops to back Somalia's transitional government in the town of Baidoa, but admit to sending military trainers. 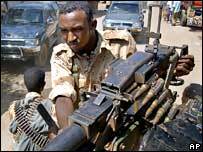 The Somali government has said its own fighters - rather than Ethiopian soldiers - have been fending off an advance by the UIC. The UN estimates that at least 8,000 Ethiopian troops may be in the country, while rival Eritrea is said to have deployed some 2,000 troops in support of the Islamic group. However, Eritrean President Isaias Afewerki denied his country had troops deployed in Somalia. Are you or anyone you know near Baidoa? Please send us your experiences and contact details using the post form below.